You are at:Home»Columns»Nature Matters»Salvation for the shy Saola? Salvation for the shy Saola? THE saola (pronounced sow-la) is of the bovid cattle family but looks more like an antelope. Found in the lowland tropical forests with little or no dry seasons, this is the world’s rarest mammal. It is cited on the International Union for Conservation of Nature (IUCN) Red list as a critically endangered species of mammal. While rarely seen, it occupies the lower slopes and valleys of the Annamite Mountain ranges, which stretch through Laos, Vietnam and into northeastern Cambodia. Saola in Vietnamese literally means ‘spindlehorn’ and is thus sometimes referred to as the Asian unicorn. 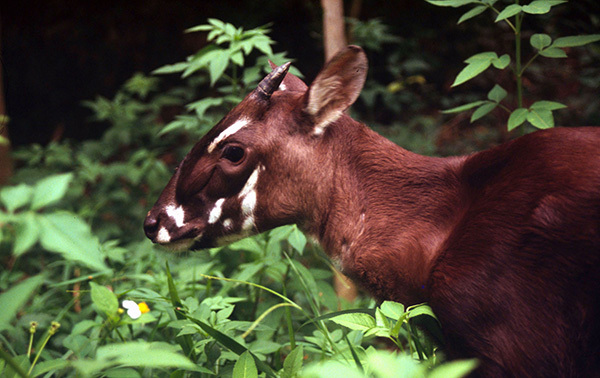 The saola was first discovered only 24 years ago by Dr Do Tuoc, who led a World Wide Fund for Nature expedition to the Vu Trang Nature Reserve in the Vietnamese section of the Annamite Mountains. Skulls of this animal had been found earlier but this was the first recorded sighting of this living animal. Local Vietnamese people today still refer to the saola as the ‘polite animal’, owing to its inherent shyness. Subsequently researchers and research students worldwide have spent many hours, even weeks, looking for a glimpse of a live saola – without success. To be truthful very little is known about this animal although one researcher did manage to trap one and took measurements before its release. This was in the days before animal tracking collars and devices were invented. He found that this saola allowed him to gently take measurements and was not unduly disturbed at the time. Standing at about one metre high to its shoulder and weighing between 80 and 100kg, the saola (Pseudoryx nghetinhensis) with its reddish antelope-like fur and distinctive white facial and front of neck markings is truly a very elusive animal. It is thought to have been around for more than eight million years. Perhaps, as yet, undiscovered cave-wall paintings in the limestone sections of the Annamite Mountains may hold the clues as to when these animals were first observed and hunted by early man. It is thought that the saola has been around for more than eight million years. Since it was first discovered in 1992, the enigmatic saola has only been seen in the wild on four occasions. With ever-increasing natural forest destruction to make way for roads and new agricultural developments, slowly the saola’s lowland forest habitat is shrinking. 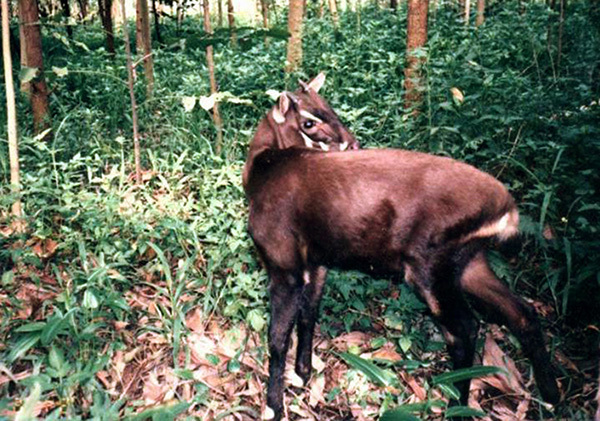 In Vietnam it was found that many of the new road construction workers snared saola to eat as bushmeat. Such wanton destruction of wildlife needs to be carefully monitored during the construction of the Pan Borneo Highway linking Sarawak and Sabah. Poaching for wild boar, muntjac and sambar deer, found in the Annamite Mountains, has led to the construction of illegal kilometre-long brushwood fences by the trappers with frequent gaps allowed in which gins or wire snares are strategically placed to trap the moving animals by their feet or legs. These gins are made of bicycle brake cables. Last year, the Saola Working Group Rangers collected 37,00 wire snares, and between 2010 and 2015, a total of 127,000 gins were confiscated and destroyed. Unfortunately wire snares are not selective in their catches, even if legally set by villagers to protect their croplands. Inevitably and tragically, saolas are entrapped and found as carcasses or bycatches as the poachers are more interested in bigger bushmeat species. The latter are sold off to the middlemen suppliers to grace the tables of moneyed people in the upmarket restaurants of Laos and Vietnam where bushmeat has become a fashionable dish. Pangolins are even illegally trapped and passed up the line to buyers in China. Global Wildlife Conservation Saola Conservation Programme director in Vietnam William Robichard has highlighted the difficulties in trying to preserve the saola by likening it to trying to save the foundations when the house is on fire. Vietnamese poachers of wild animals have been recently caught in Thailand’s Hua Khaeng Wildlife Sanctuary and also caught on camera in Cambodia’s Virachey National Park. As Vietnamese fishermen have been caught illegally fishing in the territorial waters of the Philippines and Malaysia, it is rumoured that criminal poaching gangs are now searching remoter areas of Borneo, especially for pangolins which fetch high-value prices on the wildlife trade black market. Hopefully, the saola will still exist in 20 years’ time but this will only be possible with the increased vigilance of local villagers in swiftly reporting suspicious activities of intruders into their neighbourhood to the police and to conservation rangers. Fortunately, the invention of the mobile and smartphones will play a big part in this role to alert SWAT teams as to the poachers’ whereabouts. There is little doubt that the saola is one of the world’s best secrets and conservationists, if lucky enough to see one and even photograph one, will never reveal the location of the site where this animal was witnessed, for very obvious reasons. Peculiar to Southeast Asia, I just wonder if these elusive mammals may be found in isolated lowland forest environments in the heart of Borneo? We may never know.